PRONG recently spent a week at a studio in Berlin, Germany recording an album of covers, to be released via SPV/Steamhammer as a special CD and LP edition in Scandinavia on March 25, in Germany on March 27, in the rest of Europe on March 30 and in the USA on March 31, 2015. * BLACK FLAG - "The Bars"
* BAD BRAINS - "Banned In D.C."
* ADOLESCENTS - "Kids Of The Black Hole"
* THE SISTERS OF MERCY - "Vision Thing"
* KILLING JOKE - "Seeing Red"
Adds Victor: "PRONG is excited to announce 2015 European tour dates in conjunction with our upcoming release, 'Songs From The Black Hole'. "Along with the standards and selected tracks from our newest albums, we will be performing our versions of classic influential masterpieces, as featured on the new record. "The tour has us returning to England, remarkably, for four shows after our premier UK festival appearance at Bloodstock. It will also be great to head back to Germany, Switzerland, France, Belgium, Austria and Holland with a new set and another new PRONG release." PRONG's latest release, "Ruining Lives", came out earlier this year via SPV/Steamhammer. The band took part in SLIPKNOT's Knotfest on October 25 in San Bernardino, California. 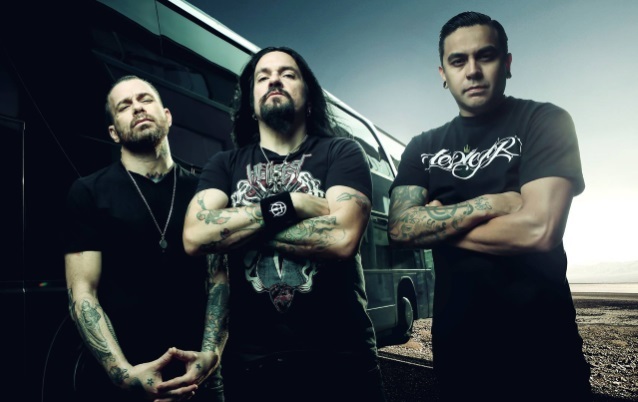 PRONG recently completed filming a video for the song "Remove, Separate Self", taken from "Ruining Lives". Brian Cox and Marcelo Palomino directed the clip.